Blaine County Sheriff Gene Ramsey said Thursday that motorist compliance was unusually high on the first night that a reduced speed limit went into effect on a stretch of state Highway 75 north of Hailey. The new limit, put in place by the Idaho Transportation Department to reduce the number of vehicle and wildlife collisions, went into effect Wednesday evening. New flashing electronic signs were installed by ITD sign technicians earlier Wednesday to advise drivers that the nighttime speed limit is now 45 miles per hour rather than 55 mph. The new speed limit applies to a 2.5- mile stretch of Highway 75 between McKercher Boulevard in northern Hailey and Zinc Spur Road. 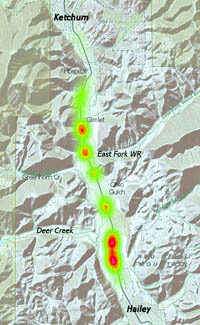 The stretch of highway is one of the most notorious areas in the county for vehicle collisions with elk or deer. Ramsey said deputies patrolled the stretch of highway for several hours Wednesday night, measuring speed limits and issuing warnings to motorists who were driving too fast. “We had a 75 percent compliance rate,” Ramsey said. “The compliance rate on this new speed limit was amazing. Seventy-five percent compliance on the first day—that’s unheard of. “The majority of the cars were within five miles per hour of the posted 45, with most being between 43 and 46,” the sheriff said. Ramsey chose not to have tickets issued, but said his officers pulled over four vehicles, three driven by local people and one by a man from out of state. He said the local people said “they knew it was coming; they just weren’t sure when we were going to start enforcing it.” Ramsey said the out-of-state driver, who was going 56 mph, said he didn’t see the signs. Ramsey said his deputies may start issuing citations next week. “The word’s out there and at some point we have to start enforcing the law,” he said. Ramsey noted that many motorists knew the reduced speed limit was coming, or knew that the stretch of highway was a hot spot for wildlife collisions, and had been driving at lower speeds even before Wednesday evening. Ramsey and ITD representatives are members of a Wildlife Crossing Committee, which serves as a subcommittee to the Blaine County Regional Transportation Committee. The subcommittee will continue to seek solutions to wildlife collisions, not only immediately north of Hailey but in other areas of Blaine County. Ramsey noted that driving at the reduced speed limit only adds about 35 seconds to the drive on the 2.5-mile stretch of highway.